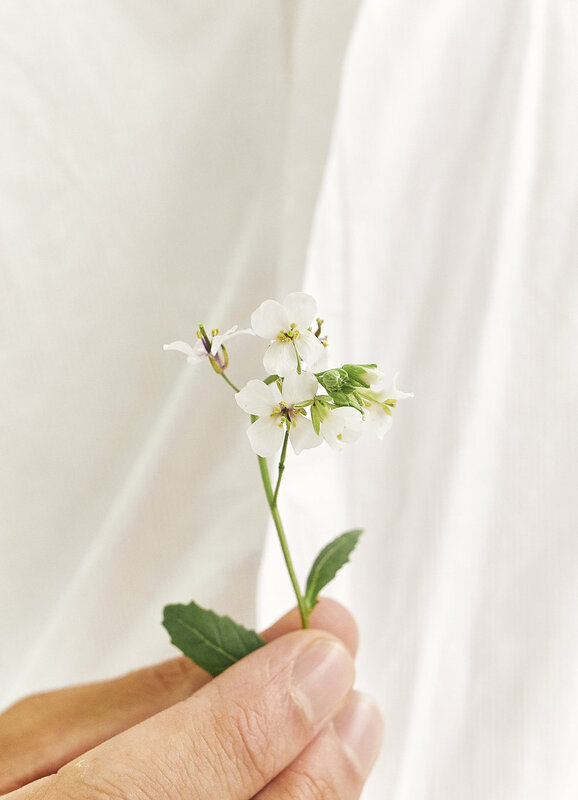 Bowery's beautiful basil is coming to a sweetgreen near you, NYC! To celebrate, come join us at the NoMad, NoLIta, or Union Square locations, where we'll be sharing delicious samples and handing out reusable utensils on 10/15 from 11am - 1pm. Bowery's basil will be available at NoMad, NoLita, Union Square, Astor Place, Greenwich Village, and 12th + University sweetgreen stores starting Monday, 10/22/18. To celebrate, we’re giving up to 15 fellow basil fanatics a free sweetgreen salad. Enter on Instagram, official rules below. Sponsored by Bowery Farming, 36 W 20th St. 9th Floor, New York, New York 10011 (“Sponsor”)..
1. Eligibility: The Bowery Farming Giveaway on @boweryfarming (the “Sweepstakes”) is open to legal residents of the fifty (50) United States and the District of Columbia (excluding residents of overseas military installations, Puerto Rico and other U.S. territories), who are age eighteen (18) or older (or at least age of majority in their state of residence, whichever is older) at the time of entry (“Entrant”). The Sweepstakes is subject to all applicable federal, state and local laws and regulations and is void where prohibited by law. The Sweepstakes is governed exclusively by the laws of the United States. 2. Agreement to Official Rules: By participating in the Sweepstakes, Entrant fully and unconditionally agrees to and accepts these official rules and regulations (the “Official Rules”) and the decisions of the Sponsor(s), which are final and binding in all matters related to the Sweepstakes. 3. Entry Period: This Sweepstakes begins on October 12, 2018 at 12:00 PM ET and ends on October 14, 2018 at 11:59 AM ET (the “Entry Period”). (b) To enter by email, email contact@boweryfarming.com. 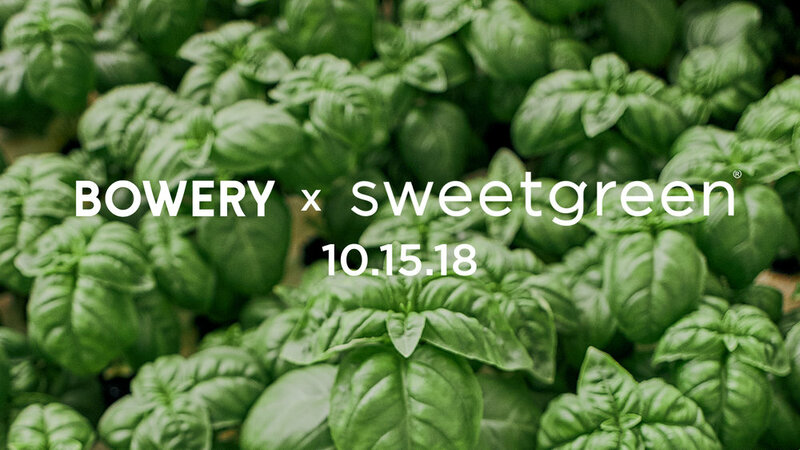 Please be sure to include Bowery Farming Basil Launch at sweetgreen Giveaway on @boweryfarming in the subject line. Entrant must write a comment in the body of the email about how Entrant feels about basil, and follow @boweryfarming and @sweetgreen Instagram accounts. All email entries must be received during the Entry Period. Entrant may be required to have social networking accounts on various social networking platforms, i.e. Instagram, Twitter and Facebook (collectively “Social Media”) in order to enter the Sweepstakes via Social Media. Only one entry per person, per Prize (as defined below), per household and/or e-mail address (unless otherwise specified) is permitted, regardless of method of entry unless otherwise specified. All entries must be received by the close of the Entry Period. Entrant may not enter with multiple email addresses nor may Entrant use any other device or artifice to enter multiple times during the Entry Period using multiple identities. Entrants submitting multiple entries or violating any of these Official Rules may be disqualified and forfeit any and all Prizes won, at Sponsor’s discretion. Entrants are required to comply with all respective Social Media platform rules and regulations when posting on Social Media platforms and are prohibited from spamming or creating fraudulent or multiple accounts. By posting on any Social Media platform, Entrant agrees to release and hold harmless the applicable Social Media platform, its parent companies, subsidiaries, affiliates and related companies, and each of its officers, directors, employees and agents (collectively, “Social Media Released Parties”) from and against any and all liability. The Social Media platforms and the Social Media Released Parties are in no way connected or affiliated with Sweepstakes, Sponsor. 1. Selection of Winners: Prize winners will be randomly selected from all entries meeting the requirements of the Official Rules. The winner will be selected by 5:00 PM ET on the business day following the end of the Entry Period at Sponsor’s headquarters. Winner(s) will be notified by direct message on Instagram or e-mail. Sponsor is not responsible for any change of email address or physical address of Entrant. Odds of winning depend on number of eligible entries received. Notification of Winners: Winners will be notified by e-mail within three (3) business days of the Prize drawing, and may be required to sign and return an affidavit of eligibility and publicity/liability release within three (3) days of notification. Prize will be forfeited if a selected Winner cannot be contacted, is ineligible, fails to claim all or a portion of a prize or, where applicable, an affidavit of eligibility and publicity/liability release is not timely received, is incomplete or modified. In the event of a Prize forfeiture, an alternate winner will be selected from remaining valid, eligible entries that were timely submitted. In the event of a dispute regarding who submitted an entry, the entry will be deemed submitted by the authorized account holder of the e-mail account specified in the entry. "Authorized account holder" is defined as the natural person who is assigned to an e-mail address by an Internet access provider, online service provider, or other organization (e.g., business, educational institution, etc.) 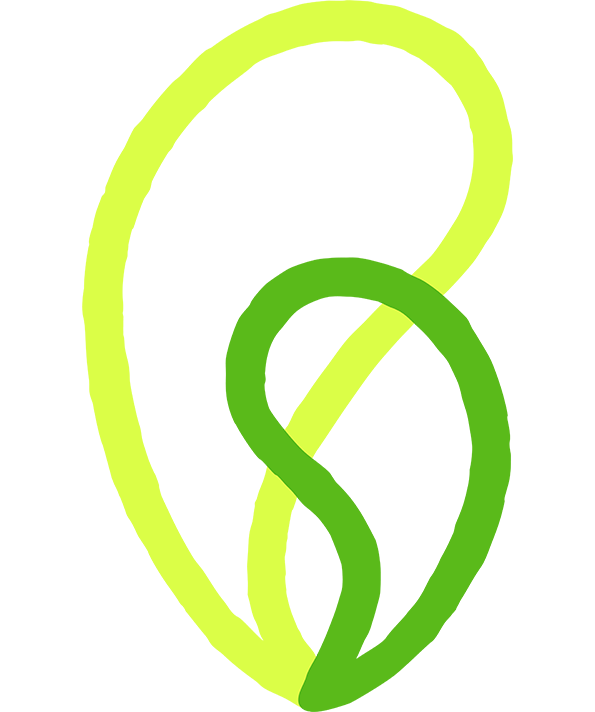 that is responsible for assigning e-mail addresses for the domain associated with the submitted e-mail address. Allow 6-8 weeks for delivery of Prize(s). Sponsor reserves the right to substitute a Prize of equal or greater value in the event the original Prize is unavailable. No substitution or transfer of Prize permitted except as provided herein. Prizes are not redeemable for cash. Gift Cards and Vouchers. The value of any Prize gift card, gift certificate, travel voucher, or travel credit, etc. is less any applicable activation, transaction or maintenance fees and subject to the fees, terms, conditions, and restrictions of the issuer, which may or may not be disclosed on the gift card, gift certificate, travel voucher, travel credit, etc. Sponsor is not responsible if any gift card, gift certificate, travel voucher, travel credit, etc. is lost, stolen, destroyed, unused, expired, forfeited or used without permission. If a gift card or gift certificate is lost, stolen, destroyed, unused, expired, forfeited or used without permission, it will not be replaced. Entry in the Sweepstakes constitutes consent to use Entrant’s name, biographical information, image and likeness for editorial, advertising, promotional and publicity purposes without additional compensation, except where prohibited by law. Entrant releases and holds harmless the Social Media Released Parties and Released Parties for any liability, claims and causes of action based on defamation or violation of rights of publicity or privacy. Employees of Sponsor and its parent companies, affiliates, subsidiaries, advertising, sweepstakes, and fulfillment agencies, their immediate family members and persons living in their same household, are not eligible to participate in the Sweepstakes. Participation in the Sweepstakes constitutes Entrant’s full and unconditional agreement to and acceptance of these Official Rules. VOID WHERE PROHIBITED. By entering, Entrant agrees to be bound by these Official Rules. The Sweepstakes is offered by Sponsor, which is not responsible for late, lost, delayed, damaged, postage-due, incomplete, illegible, or misdirected entries, responses, or other correspondence. By participating, Entrants and winners, as applicable, release Sponsor, its parent, affiliates, subsidiaries, directors, officers, employees, sponsors, and agents, including advertising and Sweepstakes agencies (collectively, the “Sponsor Released Parties”), from any and all liability with respect to the Sweepstakes or the acceptance, possession or use of any Prize. Entrants and winners further release the Sponsor Released Parties without limitation from any liability, damages or causes of action resulting from: (i) any condition caused by events beyond the Sponsor Released Parties’ control that may cause the Sweepstakes to be disrupted or corrupted; (ii) any injuries, damages or losses to any person (including death) or property of any kind resulting in whole or in part, directly or indirectly, from receipt, acceptance, possession, misuse or use of a prize or participation in any promotion related activity or participation in this Sweepstakes; and (iii) any printing or typographical errors in any materials associated with the Sweepstakes. Sponsor’s decisions in all respects relative to the Sweepstakes are final. Sponsor reserves the right, in its sole discretion, to cancel, modify or suspend the Sweepstakes in whole or in part, in the event of fraud, technical or other difficulties or if the integrity of the Sweepstakes is compromised, without liability to the Entrant. Sponsor reserves the right to disqualify any winner, as determined by Sponsor in its sole discretion. Void where prohibited or restricted by law. All federal, state, provincial and local regulations apply. All federal, state, and local taxes are the sole responsibility of the winner. Winner will receive an IRS Form 1099 reflecting the final actual value of any Prize valued at $600 or more. Consult with your tax professional regarding potential tax implications. Should the ARV of the Prize equal or exceed $600.00, winners shall provide to Sponsor their social security number and tax information for issuance of a 1099 Form. No Liability. By participating, Entrants and Prize winners agree to release, discharge, indemnify and hold harmless the Sponsor Release Parties from and against any claims made by any Entrant, prize winner, or any other third parties, related in any way to the operation of this Sweepstakes as well as any other claims, damages or liability due to any injuries, damages or losses to any person (including death) or property of any kind resulting in whole or in part, directly or indirectly, from receipt, acceptance, possession, misuse or use of a prize or participation in any promotion related activity or participation in this Sweepstakes. Released Parties are not responsible if Sweepstakes cannot take place or if Prize cannot be awarded due to travel cancellations, postponements, delays or interruptions due to acts of God, acts of war, natural disasters, weather or acts of terrorism. Winner acknowledges that the Sponsor Released Parties have not made nor are in any manner responsible or liable for any warranty, representation, or guarantee, express or implied, in fact or in law, relative to any Prize, including but not limited to its quality, mechanical condition or fitness for a particular purpose. Any and all warranties or guarantees on a Prize (if any) are subject to the respective manufacturers’ terms, and Winner agrees to look solely to such manufacturers for any such warranty and/or guarantee. CAUTION: ANY ATTEMPT BY ANY ENTRANT TO DELIBERATELY DAMAGE THE WEBSITE OR TAMPER WITH OR UNDERMINE THE LEGITIMATE OPERATION OF THE SWEEPSTAKES IS A VIOLATION OF CRIMINAL AND CIVIL LAWS. SHOULD SUCH AN ATTEMPT BE MADE, SPONSOR RESERVES THE RIGHT TO SEEK REMEDIES AND DAMAGES FROM ANY SUCH ENTRANT(S) TO THE FULLEST EXTENT PERMITTED BY LAW INCLUDING CRIMINAL PROSECUTION. Disputes and Jurisdiction: Disputes arising from this Sweepstakes, or any matter arising therefrom, whether direct or indirect, will be determined according to the laws of the State of New York, without reference to its conflict of laws principles. Entrant agrees that: (i) any and all disputes, claims and causes of action arising out of or connected with this Sweepstakes shall be resolved individually, without resort to any form of class action; (ii) any and all disputes, claims and causes of action arising out of or connected with this Sweepstakes, shall be resolved exclusively by the United States District Court of New York or the appropriate New York State Court; and (iii) under no circumstances will Entrants be entitled to, and Entrants hereby waive all rights to claim, any punitive, incidental and consequential damages and any and all rights to have damages multiplied or otherwise increased; SOME JURISDICTIONS DO NOT ALLOW THE LIMITATIONS OR EXCLUSION OF LIABILITY FOR INCIDENTAL OR CONSEQUENTIAL DAMAGES, SO THE ABOVE MAY NOT APPLY TO YOU. All issues and questions concerning the construction, validity, interpretation and enforceability of these Official Rules and Regulations, or the rights and obligations of the Entrants or the Sponsor in connection with the Sweepstakes, shall be governed by, and construed in accordance with, the laws of the State of New York, without giving effect to any choice of law or conflict of law rules (whether of the State of New York or any other jurisdiction), which would cause the application of the laws of any jurisdiction other than the State of New York. 1. Winner’s List, Official Rules: For a list of Prize winners or a copy of these Official Rules, send your request and a stamped, self-addressed envelope to Basil Launch at sweetgreen Giveaway on @boweryfarming, Bowery Farming, 36 W 20th St. 9th Floor, New York, New York 10011 for (for Winner's list only).